Front entrance to the new Clochfaen, 1915. The architect was the arts and crafts luminary W.A.S. Benson. 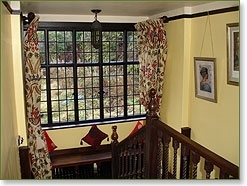 A designer in the English arts and crafts idiom, William Arthur Smith Benson is best known for his lighting devices. W.A.S. Benson also created designs for buildings, interiors, metal ware, and furniture. 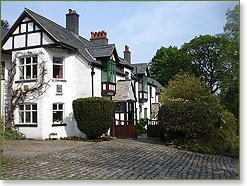 The Clochfaen - B & B, Holiday Cottages and Business Seminars. "Our architect, Mr Benson, produced a very liveable and charming house." So wrote the original owners in 1915. 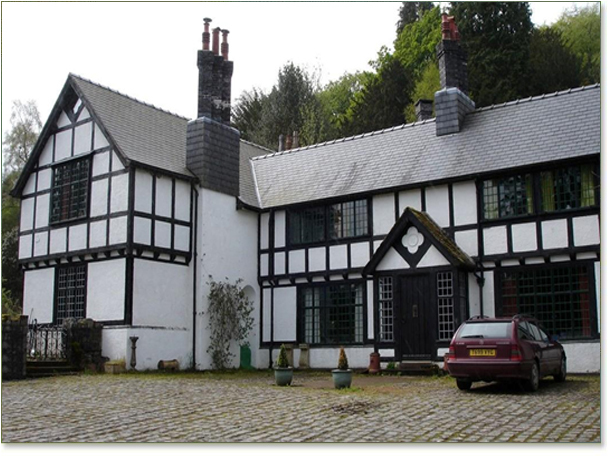 This is still the impression which The Clochfaen makes today on the visitor - and the present owners have striven to recreate the original interiors while following Benson’s aim of a liveable house for today. 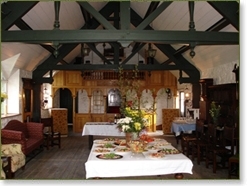 The Clochfaen offers families or groups an authentic Edwardian holiday experience and an ideal location for business seminars and events. 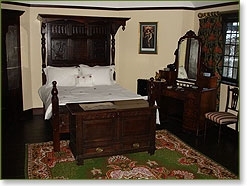 Stay in rooms once used by Prince Albert (later George VI) and enjoy the beautiful surrounding views of the upper Wye Valley from your bedroom windows. Walk over fields and mountains taking in the stunning ever changing countryside. 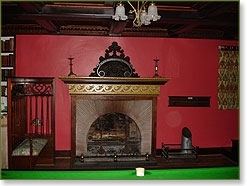 Come and enjoy the style and elegance of this fine historic home, relax in the library and enjoy a game of billiards. Spend an evening seated in front of an open fire in our library or in the drawing room, watching sky TV, or take dinner in the dining room. 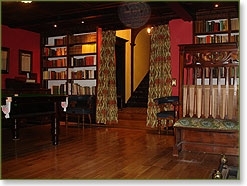 The house is entered by a small outer hall, panelled in walnut, now 200 years old, and elegantly tiled, leading into the spacious and carefully designed library and billiard room from which radiate the principal rooms. The library has a carved cornice and gilt mantelpiece, both of Charles II period and originally in Nell Gwynn’s house in Soho, London. 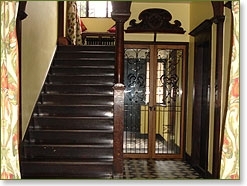 An inner hall gives access to the main staircase, kitchen breakfast room, drawing room, and garden porch entrance. 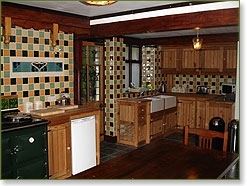 The kitchen breakfast room has a large refectory table and oil fired Sandyford range. There is a dishwasher and refrigerator. Note deep-freeze and washing machine are available in the butler’s area. 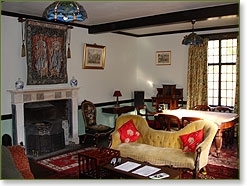 The drawing room, overlooking the valley and stone flagged gardens, has an Adam marble mantelpiece which adds to the period style of this large comfortable room. 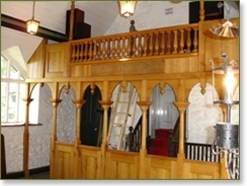 On the first floor the King’s bedroom has its own bathroom and inner landing. 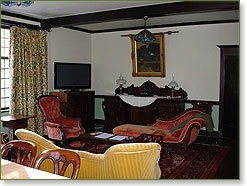 This large double room overlooks the stately Douglas firs with valley views beyond and formal gardens to the south. 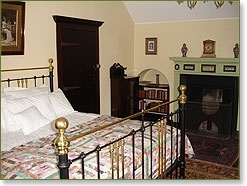 The gallery landing gives access to the nursery (two single beds), body guard’s room (double bed), dressing room (two single beds), and rose bedroom with magnificent half tester double bed. These bedrooms all have access to another bathroom, washroom and a shower room. 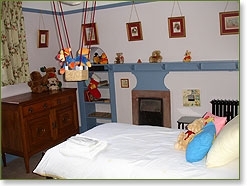 On the second floor an attic bedroom with four low single beds is accessed through a sitting room with sky TV. Note this room is suitable for children. 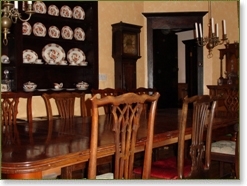 The Tenants’ Hall is a ideal room for family gatherings and can be laid out for seminars or presentations. Regrettably the hall is on the first floor and has no wheel chair access. 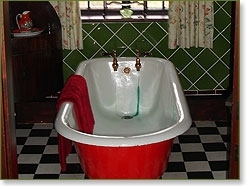 The property is has been modernised and Wi-Fi is provided through out the house. 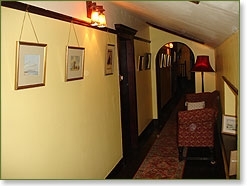 The architectural style of The Clochfaen is complimented by period furniture and stylish soft furnishings. 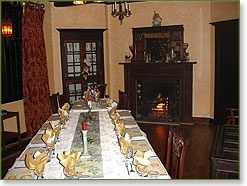 The owners regret that no pets are permitted inside the main house. If you would like to book the Main House for business purposes, please contact the owner Kevin Hughes to discuss your requirements. Guests may have the opportunity to use four miles of fly fishing on the river and rough shooting in season. Details on application. 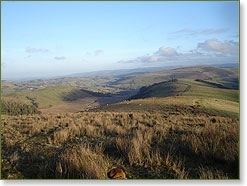 Please note that the gardens are under restoration (are not currently open), however the Clochfaen woodlands are, this is a haven for birds and wild animals.